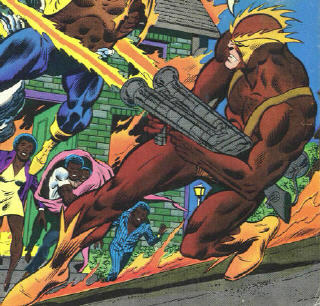 Powers: Wildfire wields a small flamethrower device, which he employs to set houses ablaze. He is quite proficient in the use of this weapon in personal combat. Harold Paprika was an unhappily married resident of an all-white neighborhodd in Jamaica, Queens. A bigot, Paprika was incensed when the African-American Simmons family moved into the area, and developed the guise of Wildfire in an effort to force them out. 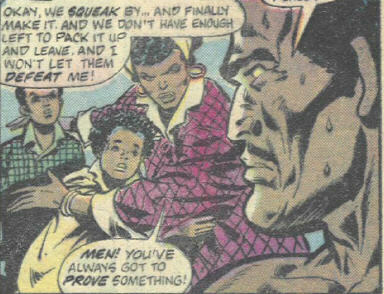 (Power Man#32)-Wildfire found himself battling Luke Cage, who had been hired by the Simmons family to protect them from his attacks. Cage. 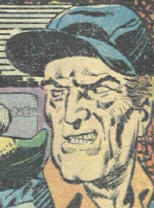 Though Cage was enraged at Wildfire's callousness (he knew the Simmons family had two young children, but still tried to burn their house down), he was unable to capture the villain. Cage and Alex Simmons tried to corner the marauder, but he was warned by another of the residents and escaped into a crowd of onlookers. A few nights later, following a typically distant encounter with his wife and her newfound feminism, Wildfire again donned his costume and assaulted the Simmons home. Once again, Cage appeared to oppose him, as did Cage's semi-ally, New York police officer Quentin Chase. Cage attacked Wildfire while Chase helped the Simmons family evacuate their home. Before the battle could conclude, Chase told the pair that the Simmons' young son, Auggie, had died in the fire. 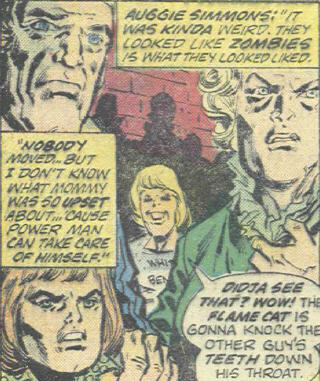 Wildfire was taken aback by this, and Cage took advantage of the delay to knock him unconscious. (Captain America I#411, [412-414]) - Wildfire was in the audience of the "Crossbones" challenge at the AIM Weapons Expo on Boca Caliente, and was presumably one of the audience members who rushed the ring when "Crossbones" was revealed as Captain America. An interesting story, initially seeming to be a simple "hero vs. racism" story but ending quite differently. See, MAX, you can do relevant stories with classic Cage! 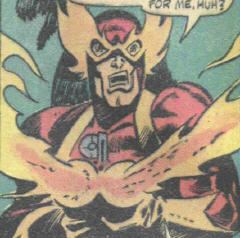 I believe it was Robert McKinney who pointed out Wildfire in the crowd of Cap411 to me (I thought it was some Plantman variation, d'oh! ), and I passed it on to Omar, and we're passing it on to you. He's on the far left of the crowd spread, right above Poundcakes. They were Wildfire's targets, though he apparently "Only" wanted to terrorize them into leaving the neighborhood. Alex Simmons and his wife Sandy hired Cage to protect them. Initially, they were determined to stay and resist Wildfire and the neighborhood's racism. However, after their young son Auggie died in Wildfire's final attack, they began to reconsider. Their daughter, Beth, blamed herself for Auggie's death (he was playing hide and seek with her, and thus was under his bed when the fire broke out) and became withdrawn due to the trauma. Ultimately, the family moved away from New York City. They were tacitly supportive of his actions, and not only refused to help the Simmons family, but also aided Wildfire by allowing him to escape his first battle with Cage.